For those of you who are trudging through a January funk, I'm offering a feel-better giveaway of some local Seattle chocolate. To enter leave a comment and tell me your fav kind of chocolate, brand and type. On Monday a reader will be chosen randomly to receive the goods. Good Luck! I have never had that brand before. What s cool wrapper. One of my favorites is mo' bacon and maple. Second would have to be Lindt' s Sea Salt, and the third is a lavender blue berry, but I don't know who the maker is on that one. I also adore Fran's almond gold bars. ohhh chocolate, I LOCE the stuff! a favourite...hmmm... Meiji do a 70% cacao which I really like. I so remember your blue monday post last year!!! All my kids know that my favorite favorite is Lindt sea salt - yum!!! At present my favorite chocolate is the dark chocolate covered ginger in the bulk bins at the grocery store. I find it hard to walk by with getting a bag of it. I always wonder if we get that blue monday. Its the first day of school here.. so lots of happy parents! lol. Yum! I am currently enjoying Chocolove's dark chocolate with ginger - it is sooo good! 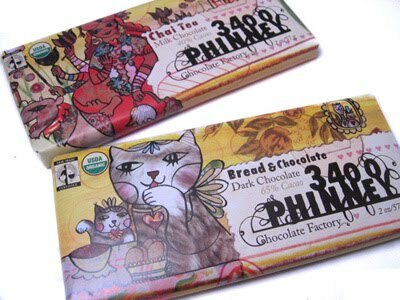 They also make a really good dark chocolate with peppermint essence. And the best part? They are $1.99 at my local market! I love Lindt and Belgian chocolate also rum raisin flavour. Up for trying interesting flavours/combinations as long as it isn't white chocolate! Hi! Thanks for the sweet giveaway! (Pun not intended). My favorite is Green & Black's Organic milk chocolate. But the wrappers are on the chocolate you're giving away are so adorable! If it tastes even half as good as it looks, I bet it's delicious. Thanks for the chance to win! This post inspired me to eat some more chocolate covered toffee from Garden Gate (famous little place in Utah). Usually my favorite type of chocolate is anything dark. Brand is tough . . . Fran's is yummy and Theo! But I'll take it all. I am truly loving the Trader Joe's dark chocolate salted caramel. The great thing about it is that it's so messy and impossible to separate into neat pieces that you can never really figure out where to stop eating. I have never eaten an entire bar at one sitting, but I have eaten half without even noticing. I also stopped by that new place, Chocolate Vitale and they have this amazing drinking chocolate. So decadent..........Luckily the kids didn't like theirs so Jeff and I couldn't let it go to waste! My favorite chocolate? Lindt and Cadbury milk chocolate are good. Haven's is a local candy maker and their toffee covered with chocolate and nuts is very good also. Last YEAR was rather blue but this year, thus far, is looking good. I'll eat any chocolate available, but I prefer milk to dark. Ritter Yoghurt, Hershey's plain or with almond, Nutella, Curry Coconut Milk chocolate by vosges, Godiva. Yum! I really like Green & Black's Toffee. Do you have the Chinook Book up in Seattle? I'm in PDX. If so, you should get one. They have lots of coupons for good quality chocolate. They've got Devine, Theo, Dagoba and Green & Black. I plan on slowly using them all. I mean. I have to. I have coupons! It's tough to choose just one (I like a wide variety), but one of my favourites is Vivani Organic 71% Cocoa.